By Clare B. Dunkle. New York: Henry Holt, 2004. Book Two of The Hollow Kingdom Trilogy. Sable crouched on the ground by the fallen Thorn's side. She heard Irina shrieking frantically, and then those shrieks suddenly cut off, but she forced herself not to look up. It was the end of everything, the end of her life. She didn't want to see it. A shadow fell across Thorn's quiet face and across the snow around them. Look at the trees, she told herself. Look at the sky. Don't give them the pleasure of making you scream. "Goblins are just a tale to frighten children." Emily might have believed this once, but she knows better now. For years she has been living happily in the underground goblin kingdom. Now Emily is old enough to marry, but when her childhood friend Seylin proposes, she doesn't take him seriously. Devastated, Seylin leaves the kingdom, intent on finding his own people: the elves. Too late, Emily realizes what Seylin means to her and sets out in search of him. But her quest, like Seylin's own journey, is really a plot devised by the cunning goblin King, who has his own reason to hunt for elves. As Emily and Seylin come closer to their goals, they bring two worlds onto a collision course, awakening hatreds and prejudices that have slumbered for hundreds of years. In this sequel to The Hollow Kingdom, Clare Dunkle draws readers deeper into the magical world that Lloyd Alexander, winner of the Newbery Medal, calls "as persuasive as it is remarkable." 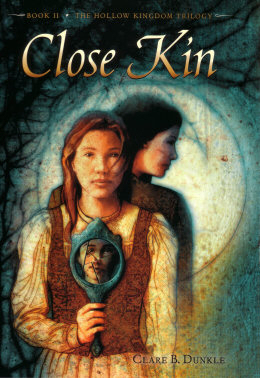 Buy CLOSE KIN in paperback. Buy CLOSE KIN in Kindle edition. An ALA 2005 Best Books for Young Adults nominee. "The plot of CLOSE KIN is intricate, the characters sharply drawn and believable, given the author's premise of three such disparate races moving in their own spheres. The relationships between the characters are skillfully portrayed; this is one of Dunkle's strengths as a fiction writer. Fantasy-lovers will find CLOSE KIN engrossing and will be waiting eagerly for Book Three." Selected for the 2005 New York Public Library's Books for the Teen Age. "... Both decidedly alien and strangely romantic at the same time—qualities that neatly encapsulate the allure of the first two books in the Hollow Kingdom Trilogy. ... Returning readers will appreciate the expanded view of a world where human, goblin, and elf sensibilities interestingly, if not harmoniously, coexist."